Not to be confused with Independence Day (Pakistan). Pakistan Day (Urdu: یوم پاکستان‎, lit. Yaum-e-Pakistan) or Pakistan Resolution Day, also Republic Day, is a national holiday in Pakistan commemorating the Lahore Resolution passed on 23 March 1940 and the adoption of the first constitution of Pakistan during the transition of the Dominion of Pakistan to the Islamic Republic of Pakistan on 23 March 1956 making Pakistan the world's first Islamic republic. A Republic Day parade by the armed forces is often part of the celebrations. Pakistani soldiers during the Pakistan Day Parade in 2016. The day celebrates the adoption of the Pakistan resolution by the Muslim League at the Minar-e-Pakistan (lit. Pakistan Tower) that called for establishing an independent federation comprising provinces with Muslim majority located in north-western and north-eastern region of British controlled territories in India (excluding autonomous princely States) on 23 March 1940. Since then, the day is celebrated annually throughout the country as a public holiday. The Armed Forces of Pakistan usually hold a military parade to celebrate the event. 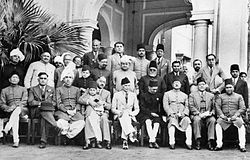 Group photo of Muhammad Ali Jinnah (in centre) and some of the Founding Fathers of Pakistan in Lahore, c. 1940. The Muslim League held its annual session at Minto Park in Lahore, Punjab, that lasted from 22 to 24 March 1940. During this event, the Muslim League led by Muhammad Ali Jinnah and other Founding Fathers narrated the events regarding the differences between Hindus and Muslims, and introduced the historical resolution that cemented the formation of a nation-state in South Asia as Pakistan, even though it did not actually mention Pakistan at all. The British plan to partition Indian subcontinent into two dominion- India and Pakistan was announced on 3 June 1947. In the event Pakistan was created on 14 August 1947 and Indian independence came a day later. Pakistan was immediately identified as migrant state born amid bloodshed. Muhammad Ali Jinnah the founder of Pakistan became first Governor General of Pakistan and Mr. Liaqat Ali Khan, The first Prime Minister of Pakistan. The Indian Act of 1935 provided the legal framework for Pakistan until 1956, when the state passed its own constitution. While Pakistan's Independence Day celebrates its freedom from British Rule, the Republic Day celebrates of coming into force of its constitution. Works and efforts by Basic Principles Committee drafted the basic outlines of the constitution in 1949. After many deliberations and years of some modifications, the first set of the Constitution of Pakistan was enforced in the country on 23 March 1956. This marked the country's successful transition from Dominion to Islamic Republic. The Governor-General was replaced with President of Pakistan as ceremonial head of state. The main celebration is held in Islamabad, the capital of Pakistan. The President of Pakistan is usually the Chief Guest; also the attended in public are Prime Minister of Pakistan of Pakistan alongside the Cabinet ministers, military chiefs of staff, and chairman joint chiefs. A full inter-services joint military parade is rehearsed and broadcast live by the news media in all over the country. Pakistan military inter services also shows a glance of its power and capabilities during this parade. The celebrations regarding the holiday include a full military and civilian parade in the capital, Islamabad. These are presided by the President of Pakistan and are held early in the morning. After the parade, the President confers national awards and medals on the awardees at the Presidency. Wreaths are also laid at the mausoleums of Muhammad Iqbal and Muhammad Ali Jinnah founder of Pakistan. In very rare times and significance, foreign dignitaries have been invited to attend the military parade. 1983 Brigadier Nasir Mehmood 1st Punjab Regiment . 1987 Brigadier Afzal Janjua SJ FF Regt Later Lt. Gen.
1998 Brigadier Akram Sahi FF Regt Later Maj. Gen.
1999 Brigadier Khalid Nawaz Janjua 3 Baluch Regt Later Lt. Gen.
2005 Brigadier Naushad Kiani Punjab Regt Later Maj. Gen.
2007 Brigadier Tariq Ghafoor FF Regt Later Maj. Gen.
2008 Brigadier Ihsan ul Haq Later Maj. Gen.
2017 Brigadier Amer Ahsan Nawaz 3 Baluch Regt Now Lt. Gen. Parallel steps by Pakistan Army. Parallel steps by Pakistan Navy. The Sherdils of Pakistan Air Force usually takes part in the parade. The Minar-e-Pakistan glances on the eve of 23 March 2014. The Sherdils of PAF performing aerial acrobatics during the 2015 parade. Group photo of the Frontier Force Regiment prior to the participation on the Pakistan Day in 1974. Two JF-17 Thunder fighter jets flown at the Joint Inter-Services parade in Islamabad on 23 March 2007. ^ Stacy Taus-Bolstad (April 2003). Pakistan in Pictures. Twenty-First Century Books. p. 49. ISBN 978-0-8225-4682-5. Retrieved 22 March 2011. ^ a b John Stewart Bowman (2000). Columbia chronologies of Asian history and culture. Columbia University Press. p. 372. ISBN 978-0-231-11004-4. Retrieved 22 March 2011. ^ a b c d Agencies (23 March 2012). "Nation celebrates Pakistan Day today". The Nation. ^ Olson, Gillia (2005). "Holidays". Pakistan : a question and answer book. Mankato, Minn.: Capstone Press. ISBN 0736837574. ^ Singh, Sarina; et al. (2008). Pakistan & the Karakoram Highway (7th ed.). Footscray, Vic. : Lonely Planet. ^ Rizvi, Hasan Askari (23 March 2015). "Pakistan and March 23" (Special works published by Dr. H.A. Rizvi). Express Tribune, Rizvi. Express Tribune. Retrieved 23 March 2015. ^ DAWN.com (23 March 2015). "Pakistan holds first Republic Day parade in seven years". Dawn News, 2015. Dawn. Retrieved 23 March 2015. ^ Cohen, Stephen P. The idea of Pakistan. Brookings Institution Press, 2004. ^ Ghazali, Abdus Sattar. "The First Islamic Republic". Islamic Pakistan: Illusions and Reality. Islamabad: National Book Club. Retrieved 21 March 2018. ^ Staff work (22 March 2015). "Preparations complete for Pakistan Day parade on March 23". NewsTribe, 2015. NewsTribe. Retrieved 24 March 2015. ^ a b c d DAWN.com (24 March 2015). "Pakistan holds first Republic Day parade in seven years". Dawn Newspapers, 2015. Dawn Newspapers. Retrieved 24 March 2015. ^ a b c Dawn.com (24 March 2015). "Relive Pakistan Day: 1940 – 2000". Dawn archives, 2015. Dawn archives. Archived from the original on 24 March 2015. Retrieved 24 March 2015. ^ "Nation celebrates Pakistan Day 2018 with military parade, gun salutes". Dawn. 23 March 2018. ^ "Pakistan Day celebrations: Civil-military leaders, foreign dignitaries attend military parade in Islamabad". Dawn. 23 March 2019. ^ "Saudi Arabia, Chinese and Turkish Military contingents to participate in Pakistan Day parade on". Timesofislamabad.com. 7 March 2018. Retrieved 20 August 2018. ^ "UAE troops to participate in Pakistan Day parade". Arab News. 20 March 2018. Retrieved 20 August 2018.